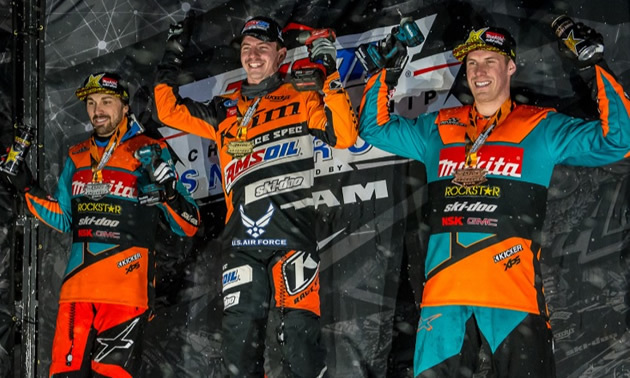 Ski-Doo snocross athletes claimed the top step on the Pro podium this past weekend in Deadwood, South Dakota. 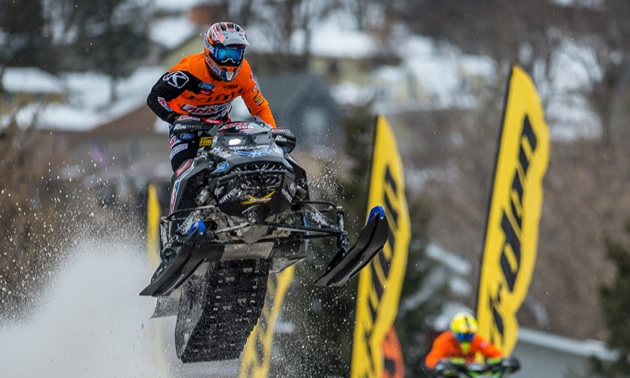 For the seventh and eighth consecutive races, Ski-Doo snocross athletes claimed the top step on the Pro podium this past weekend in Deadwood, South Dakota. It was another weekend of pure dominance in the Pro class as X-Team riders took five of a possible six podium places. The snow fell heavy and the action was hot on the short, bullring track Friday night for Round 7. Just as he’s done the first three weekends of the season, Lincoln Lemieux (Scheuring Speed Sports) was on top of his game for the weekend’s opening round. A hotly contested race had Lemieux sitting in front when a red flag crash involving Ski-Doo Pro rookie Aki Pihlaja (BOSS Racing) halted the race. With only three laps to go, the restart would be critical for many because of the heavy roost and tight track. Lemieux started strong again and held point for the final three laps while Tim Tremblay (Warnert Racing) made the most of it by moving from fifth to second - with some aggressive passes - while Adam Renheim (Warnert Racing) came home third, completing yet another Ski-Doo podium sweep. Saturday’s racing continued on one of the roughest tracks this season. The Pro final would prove exciting once again as the start saw everyone fighting through turn one and then three racers going for it down the second straight, one of those was points leader and Ski-Doo racer Elias Ishoel who unfortunately crashed hard. But Pihlaja was another guy on the gas and had things under control from the green flag. Firmly establishing his lead at turn two, Pihlaja led green-to-checkers for his first win as a Pro racer. An accomplishment made even more impressive after having to bounce back from crashing out of Friday night’s race less than 24 hours earlier. Lincoln Lemieux capped his strong weekend with a third-place finish on Saturday. Adam Renheim finished fourth after a second row start. Saturday’s win moved Pihlaja within 20 points of the top-5 in the season standings. Ishoel continues to lead in the chase for the points title. He’s followed by Lemieux and Renheim who sit tied for second. Tim Tremblay is currently fifth for the points title. Snocross action continues this Feb. 1-2, 2019 at the Soaring Eagle National in Mount Pleasant, Mich.
Ski-Doo’s Hunter Patenaude (Scheuring Speed Sports) claimed his first ever win in the Pro Lite class on Saturday night. A consistent performer all season, Patenaude finally broke through on top of the box and currently sits second in the overall Pro Lite season points standings. He’s the second Patenaude to register his first career Pro Lite win this season. Brother, Leo Patenaude, captured his first career Pro Lite victory earlier this season. Francis Pelletier (Warnert Racing) turned in another solid weekend with two third place finishes in Pro Lite. He remains the overall points leader in the Pro Lite standings at the halfway point of the season, followed by Hunter Patenaude, Ski-Doo’s Marcus Ogemar (Bauerly Racing) and Max Taillefer, who grabbed a second place finish on Friday night to hold the top four spots for X-Team racers. In the Pro Women’s class, Ski-Doo athlete Megan Brodeur is charging ahead with machine-like precision. She captured two more podium finishes on the weekend with a second-place on Friday night and took the win on Saturday. As the season heads towards the second half, Brodeur continues to strengthen her grip on the top spot in the chase for the points championship. She currently sits 40 points clear of the second place rider, and shows no signs of slowing. 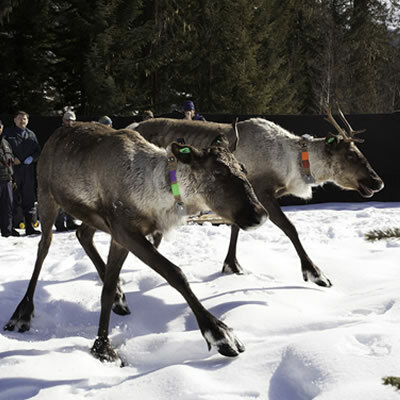 Ski-Doo Sport and Sport Lite riders recorded a total of five podium finishes on the weekend. Samuel Blouin came away with the checkered flag Friday night. Minnesota native Colton Lugert continued to find his mid-season form with a third-place finish Friday as well. Jordan Lebel doubled up winning both Friday and Saturday Sport Lite rounds of racing. The pair of top podium finishes gives Lebel three wins in his last four rounds of racing. He was accompanied on the podium Saturday by Jake Belair in second place. Lebel leads in the overall points standings, and Belair currently sits fifth.